Hey guys! I've got a little afternoon snack for you today -- Pretty and Polished swatches! These aren't a part of any collection (I don't think anyway...) but all came out around the same time. 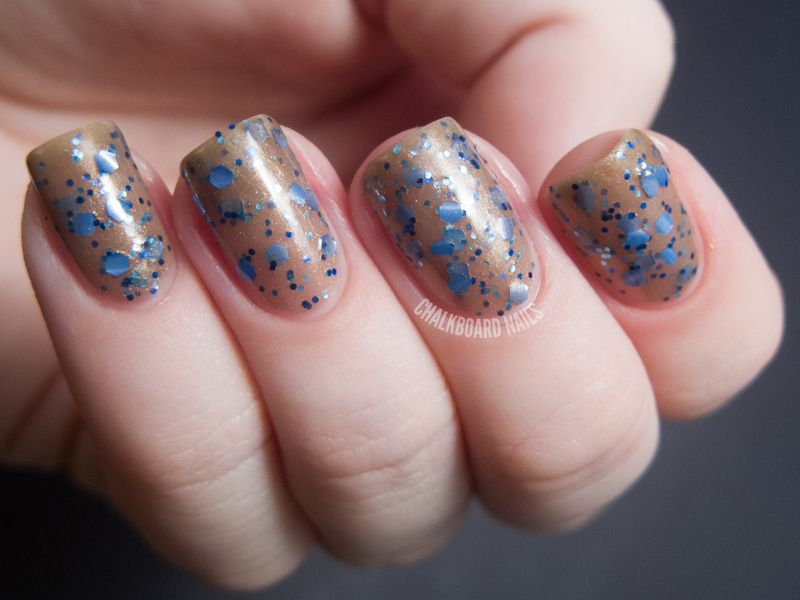 Heist is a micro gold flakie topcoat. I've shown one coat of it here over MAC Hyper. It's subtle and lovely, a perfect way to add a little refined bling without going over the top. Clouds In My Coffee is a brown shimmery base with medium and small blue hex glitters. This shows three coats. The larger glitters in this polish had curled a bit by the time I got to swatching them. I have pretty curved nails though, it might be less of a problem if your nails are flatter. You could also put in a bit of extra effort and flip all of the larger glitters so they followed your nail's natural curve. Power Cosmic is a mix of orange, green, and blue glitters in a gray jelly base. This is three coats of it alone, though I bet it would also look great if you just put one coat over a dark creme base. I absolutely love the look of this one. Super beautiful for fall and nicely complex. It is a bit of a topcoat eater -- I've used two coats of Seche Vite here. Private School is my favorite out of this bunch! It's warm grey with black and white glitter accented with lots of micro red. Chelsea's inspiration for this was an argyle sweater, and I can totally see that! I love the "buried glitter" look in this one -- the base has just the right opacity. Pretty and Polished products are sold on Etsy. Please check out the P&P Facebook page for information about restocks and new color releases. I really love power cosmic! Mardi Party looks fabulous! Looks like I'll need to hunt that one down. oh my lord. everything is so brilliant!!! esp the clouds in my coffee! Private School and Cosmic Power are gorgeous! I'll have to look out for those two at chelsea's next restock! Private school is my fave too! 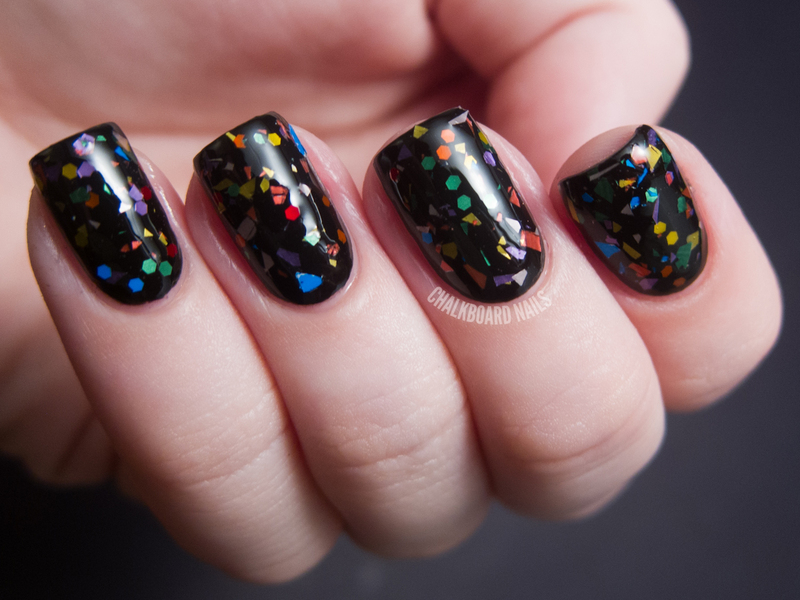 Mardi Party looks really cool, I love the balance of hexes & shreds - and it seems that it's not too glitter-packed, which is good. Beautiful swatches as always. Love the first one! Private School is my favorite, too. Almost a glitter sandwich in a bottle. My favourite is Heist :) So subtle! I have to have Clouds in my coffee and Private School! Clouds In My Coffee and Mardi Party are amazing! I love that we have a "different" rainbow glitter. It really does look like party confetti. And CimC is so unique too... and I love coffee. MUST PURCHASE. I love Clouds In My Coffee and Private School! So cool! I cant even pick a favorite this time! OK so Mardi Party is the coolest thing ever. OH GOD. Mardi Party is unbelievable.